(NORTH BAY, ONT.) – Canadore College celebrated the grand opening of its much-anticipated post production facility earlier today. Over the past 12 months, the college built a 5,588 sq. ft. post production centre to provide industry-leading solutions for film and television projects to be shot, edited, mixed and finalized entirely in northern Ontario. The facility brings together coordinated services, resources as well as professional and emerging talent to support a production’s whole life cycle. 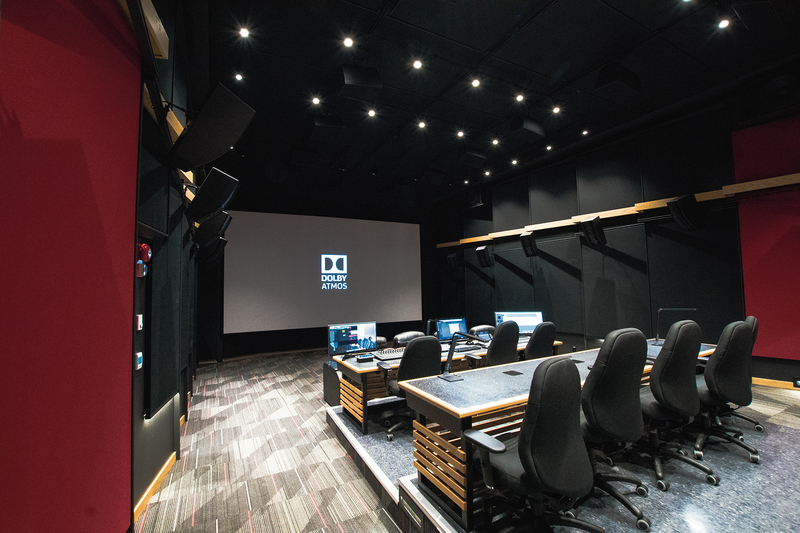 Post Production at Canadore (PPC) boasts a Dolby Atmos mix stage with 70,000 watts of power and 41 speakers, colour correction room, dialogue replacement (ADR), and specialized computer and software equipment that is not being used in any other teaching facility in Canada. The centre offers industry the ability to perform dailies, audio mixing, audio and picture post editing, digital imaging, closed captioning and more. Unlike any other post production facility in Ontario, PPC was designed to serve Canadore’s educational infrastructure and offer flexible services to industry at optimal rates. According to provincial statistics, for every $1 million of film and production spending, 21 full-time and associated jobs are generated. Regionally, North Bay and area saw 11 film and television productions in 2017, resulting in millions of dollars in local investment being made over 270 filming days and 218 locations. The college’s broadcast television, digital cinematography and post production programs all directly link to the PPC facility. Other programs within the School of Media, such as acting for screen and stage, and advertising and graphic design will also play a larger role in subsequent years. All told, 125 creative industry students graduate from postsecondary programs at Canadore each year. Canadore’s post production centre was built with investments by the Northern Ontario Heritage Fund Corporation (NOHFC), FedNor and the college.